Domestica! Isn't that just the best name? Three-ish years ago, I met this rad girl named Chrissy online. She has impeccable taste and shares her awesome finds on a blog called Gussied Up and also features local family-friendly events on another blog called Small Town Fun. We ran into each other periodically via the Des Moines craft fair scene and became good pals. She's one of those people who I would just love to talk to forever, because her knowledge of crafty things and music and all things interesting is endless. Chrissy and her friend Leah are starting a new adventure, and opening up shop in bricks-and-mortar form and online. 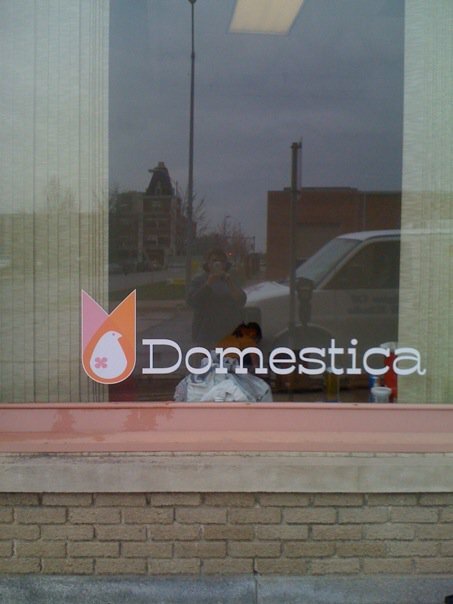 Their shop is called Domestica. And it's very exciting. In their words ... Domestica's goal is to promote the quality and value of handmade/cottage industry craftsmanship; planting the seed of great design that's kind to the environment, kind to the artist and kind to your pocketbook. Cool stuff for your home, but we're just too girly to completely glaze over personal accessories – we have so many favorites, we have to share. Our focus is super cool home and personal accessories – valuable pieces to help you spruce up your nest and adorn your bod. They'll be having a soft opening on April 17th, so stop by to check out what they've done with the place. (I personally can't wait to see!) The official Grand Opening is April 24th. Domestica is located on the SW corner of Walnut and East 4th Streets at 321 East Walnut, in Des Moines' Historic East Village neighborhood. Jump on over Domestica's blog right now, where they've been so kind to feature my fabric flower tutorial. You can (and should) also follow them on Twitter and Facebook to keep up with all of their exciting opening day news. *Bonus. These girls are awesomely cool and funny, and I assure you, totally worth a follow. PS. We stole our name from the NE band, Mercy Rule who may/may not have stole it from another NE band, Cursive's record of the same name (I still call it a record). Danelle Williams of Craft Sat fame and I spent at least a month to come up with a name that was practically in our back yard. So happy Leah liked it enough to keep it. PSS. Every time I read Elsie's A Beautiful Mess, I think "these are Jen G's peeps." Was happy to see you mention them. So funny that you ladies are hooking up Jen. Leah has been a good friend of mine for years, and I always thought you two would hit it off due to so many similarities in style. So excited for them on their new adventure! I am SO bummed that I'm so far away. I'm a native Iowan and a true Iowan at heart, but live in Michigan now. The store sounds awesome, and I've added the blogs to my list! If I ever find my way driving through Des Moines I will definitely stop. love the logo so cute, wishing you all great success!